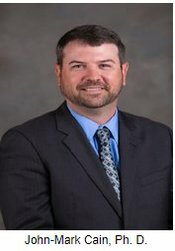 Dr. John-Mark Cain, Superintendent of Lauderdale County Schools, like former superintendent Randy Hodges, has a vision for all students with a desire for involvement in Performing Arts. Dr. Cain's vision will be continued with the partnership formed with The Performing Arts Department at Meridian Community College. The partnership works well; all involved work hard to offer an annual production for students to showcase their talents. The yearly play takes hours of practice and brings the community together for an unforgettable performance. This year will be no different than the ten previous years as we present the spectacular play Peter Pan. As we begin the 11th year of our partnership with The Fine Arts Department at Meridian Community College, those that have been around say that the competition has grown each year and this year was certainly no exception as our talented students brought their best performances to the auditions. Once again, we were able to choose two casts of characters: the Green Cast and the White Cast. This allows to showcase more student talent. As our middle and high school students begin to prepare for the 2019 performance, Peter Pan, please join us in congratulating the Green Cast, the White Cast, our Ensemble and Crew! The past performances have proven the Lauderdale County School District has a bright future with our talented, young teens. Our first production in 2009, The Wiz, set the precedence of what was to come. In 2010, our students excelled in their performance of AIDA, followed in 2011 with their rendition of Back to the 80's. Without disappointment, the 2012 performance of Disco Inferno proved once again that there would be no stopping our most talented students. The bar was raised in 2013 with the hit Guys and Dolls as our students performed with a live orchestra for the first time. The performance in 2014 allowed us to revisit our past with a grand version of All Shook Up and the performance in 2015, a family classic known as Beauty and the Beast, included students in middle and high school. Those same aged students performed Carnival in 2016 and proved that all of our students come together when it's time for the annual Performing Arts play. The 2017 performance, Kiss Me Kate was inspired by the onstage/offstage battling of husband and wife actors and it was an exceptional performance. As in years past, you showed your support to our performers as they made their way through the classic journey in The Wizard of Oz. 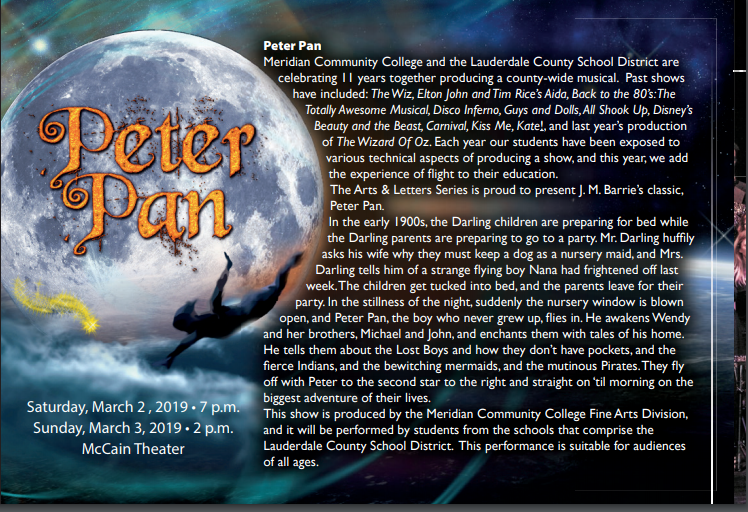 Let's begin our 11th year with that same support and please make plans to attend the best performance yet as our students present Peter Pan!